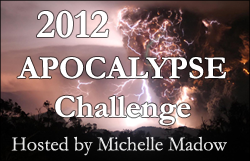 Michelle Madow: 2012 Apocalypse Challenge! Welcome to the 2012 Apocalypse Challenge! I'm excited to do this challenge because I love apocalyptic stories! My favorite part of them is not only reading about the disaster itself, but how people survive. When thrust into a major disaster, characters have to interact and learn how to get along with people they might have never had a conversation with otherwise. I love seeing how characters grow and mature when put in intense situations like the ones in the books you will read in this challenge. Check out the Apocalypse Challenge Goodreads List for suggestions of what to read. Feel free to add your own suggestions to the list! Books like Hunger Games, Uglies, Matched, etc. do not count, because the main characters do not remember what "normal" life was like. Those books are dystopian, not apocalyptic. There is a difference. The books do not have to have been published on 2012. You just had to have read them in 2012. (1) Sign up on the Linky below! (5) Want to read three or more apocalyptic books this year! I'm a french reader but i'm interresting by your challenge... Can I to participate ??? I pay a visit each day some web pages and blogs to read articles or reviews, except this blog presents quality based articles.